7:20AM Cleaned the mackerel by head and gutting them and then making cuts every 3/4 of an inch down each side of the fish so the marinade will penetrate. I’ll let them sit in the marinade til 9:30 or so. Check back around 10 for the next update! Changed plans and opted for the Kettle as it was such a small cook. Set up the kettle for the snake method (arrange a fuse of coals around the perimeter so the coals act as a fuse with only so many coals going at once) looking for 225-250 degree grate temps. Once it hit 200 I shut down the bottom vent to 3/4 closed and left the top vent wide open. 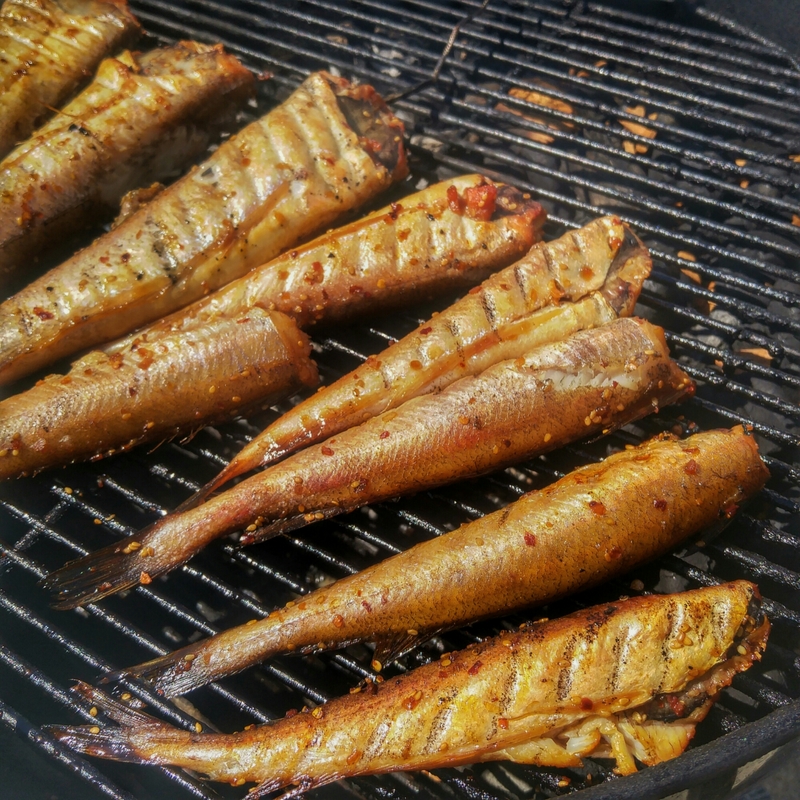 Placed the mackerel on offset of the coals. 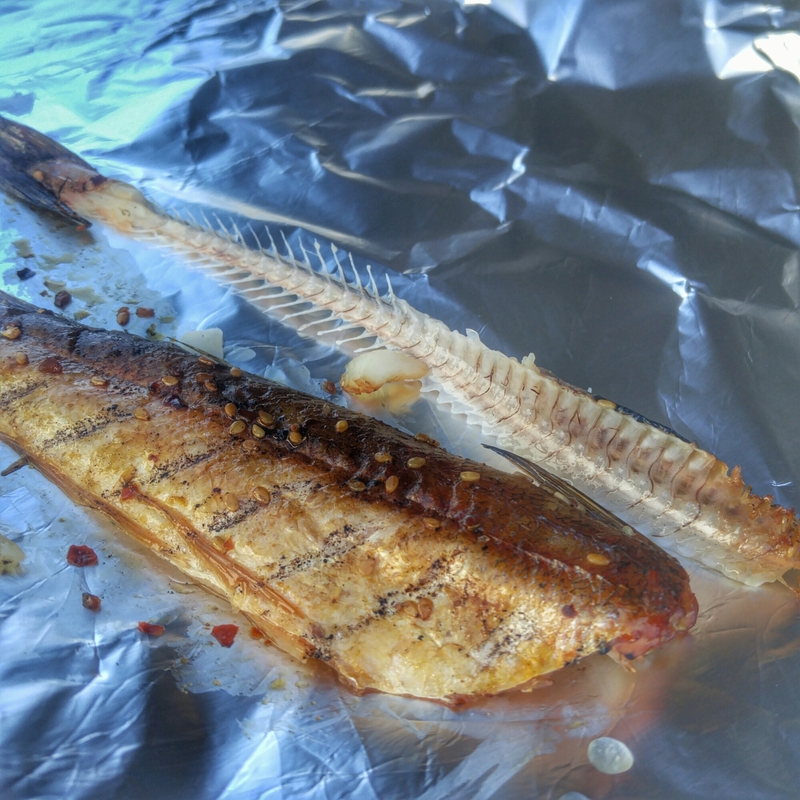 First deheaded, gutted and scaled the whiting. Then gave them a bath in some soy/sesame/ginger/red pepper flake marinade for about an hour. 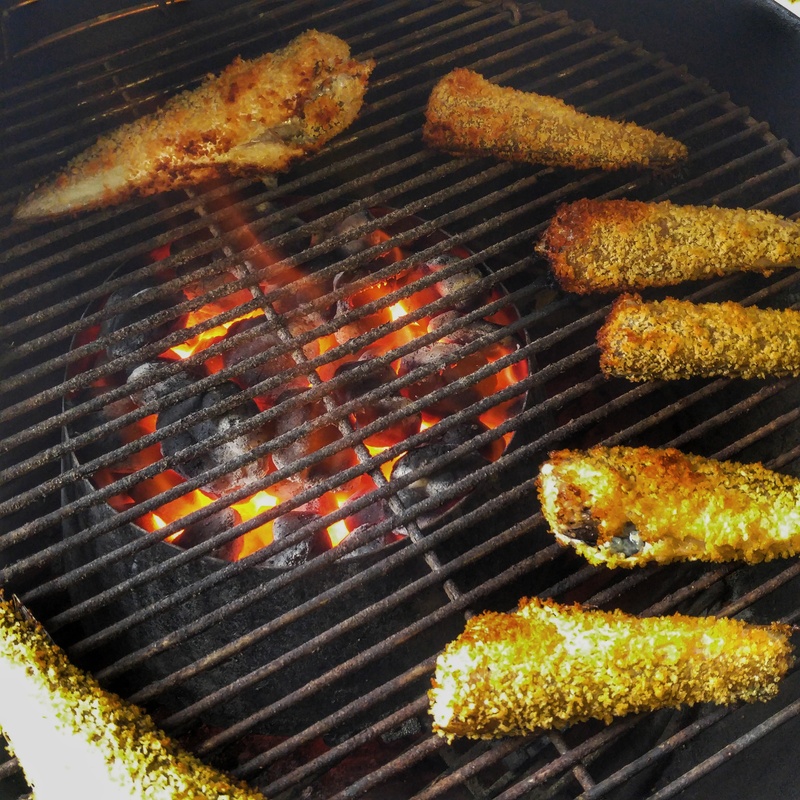 Then took them out of the marinade and placed them on the grill grates to dry for an hour or so while getting the coals set up for smoking using the snake method on the Weber Kettle. 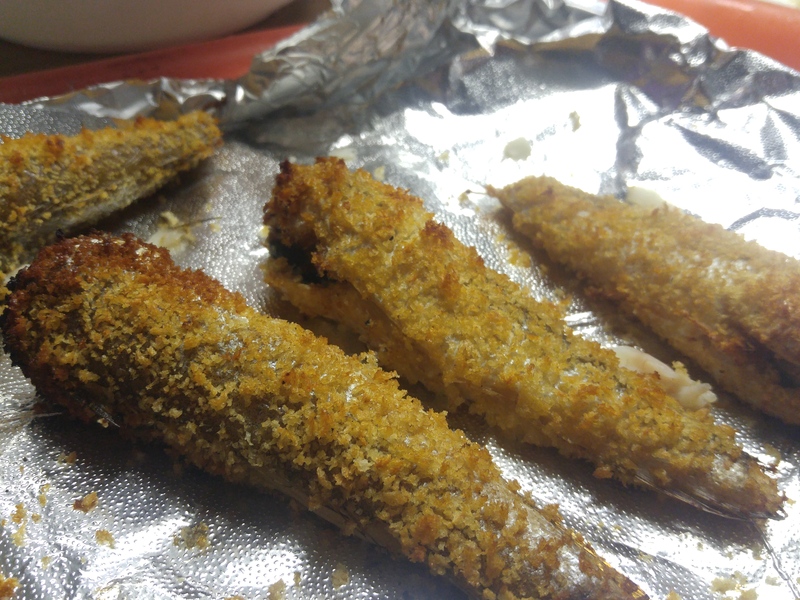 When the temps on the Kettle reached 190 I placed the marinade and dryer whiting on. Looking to bring them up to about 140 degrees internal temp. Check back in to see the results! After 45 minutes I pulled off a small one and OMG! Found This Recipe here The recipe was written by Tommy Thompson From Florida Sportsman Magazine and Helen is his mom. I broke the tuna into 3/4 inch chunks because I figured that when I mixed all the ingredients together it would break it down a little more and I didn’t want it to be a mousse, I wanted every dip of a cracker to have a decent amount of solid smoked tuna on it. I added 1.5 Tablespoon of tabasco. Also salt and crushed black pepper to taste. Mix it up and let it chill for an hour or more. This recipe was easy to make, didn’t include too many crazy hard to find ingredients and was absolutely delicious. With the nice kick of the salt and Tabasco it went perfectly well with some nice cold beer. I will be making more for Thanksgiving! You can get smoked fish all the time at Connolly Seafood in Gloucester MA to use if you’re not all about that smoking/BBQ lifestyle. Thank you Tommy Thompson for sharing your mom’s recipe. Thanks to skipper Brian Higgins aboard the F/V Toby Ann we’ve got some beautiful tuna steaks to smoke up today. Last night I trimmed them up and put out my ingredients for the overnight marinade and added two more ingredients: Fresh Ginger which I’d grate into the bowl and finely chopped up yellow Cayenne Pepper. Here’s one of teh tuna steaks before i put them to bed sealed in Ziploc bags overnight. This morning virtually all of the liquid of the marinade got sucked up by the tuna and it turns the tuna almost candied with the soy and the brown sugar getting all sucked up inside the flesh. 5:15 AM Lay out the tuna on the Weber Smokey Mountain racks to dry. 6:45AM Set up the smoker using the snake method apple wood chunks and cherry wood chips dispersed along the fuse. Lit 8 briquettes in the chimney and dumped them onto the left hand side of the charcoal fuse. 8:00AM Update: Tuna steaks are cranking along but pit temps aren’t climbing the way it was the last time I smoked tuna. Pit temp 165 at grate level one hour into the smoke. I opened the feeder door to let some air in and added some cherry chips to stoke the coals a bit. Tuna internal temp 150 degrees and they come off. I take the tuna steaks off and place them on the cool grates of the Weber kettle to dry.